5B Hickory Ln - Outdoor Living & Beautiful New Beach Home. 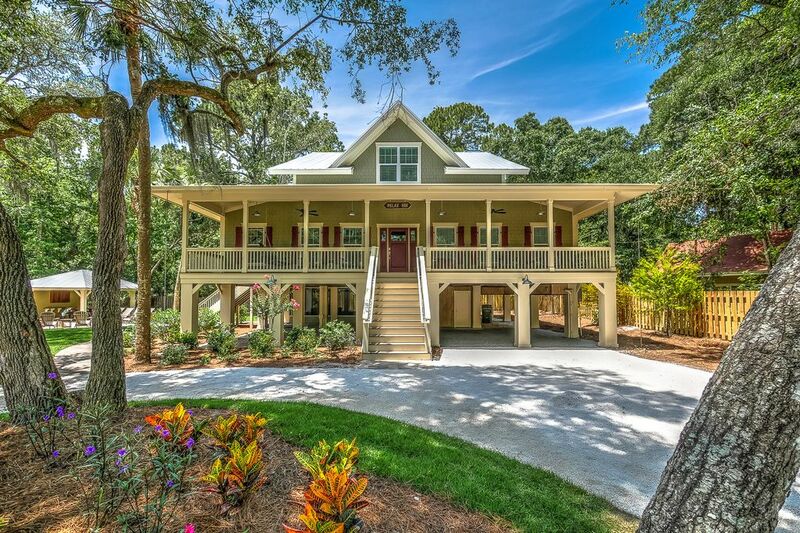 This 5th-row ocean, custom-built escape is the epitome of southern island charm. The sweeping front porch with rocking chairs beckons you to unwind and move to the rhythm of the nearby waves. Immediately upon entering, you will find an open concept living space that directs you to a spacious screened in porch–perfect for entertaining–and overlooking an outdoor island sanctuary. Private and thoughtfully landscaped backyard, patio and pool area complete with *heated pool, and spa that easily accommodates 10, lawn fire pit, and shaded poolside pavilion with bar, flat screen TV, and grill. When you’re not basking in the truly great outdoors the main level has two king master bedrooms–one of which has an en-suite bath that includes a walk-in shower with separate claw foot 6’ soaking tub. Along with 5A Hickory, this is an ideal spot for weddings. And both are just a short walk to the beach. Please inquire about having your wedding at these beautiful homes when making your reservation. •	Private Pool (16 x 30) *This pool & spa have an electric heat pump. The pool & spa can be heated for an additional fee of $300 + tax per week. •	Private spa *If you would like to heat the spa only, the cost per week is $225 + tax. •	5A and 5B Hickory are perfect for large family gatherings. Family Fun! Relax and unwind. Fabulous home to relax and enjoy time with family and friends. The house is open and warm, equipped with everything you need and more. Short walk to the beach and pool/hot tub combo in back yard. You don't want to leave because it is like being in a resort but the feeling of home. Hope to return soon. Thanks for sharing your beautiful house.